The life of a freelancer does not jive well with sleeping normal hours (or at all, some days). The past month and a half has been insane and, while I’ve been buying a lot of gear and software with the proceeds, I haven’t actually gotten to use any of it for my own enjoyment. Yet. You know how I say, “The best camera is the one you have with you!” ad nauseum? Well, in this case I took my iPod Touch out to snap a quick pic with some Photoshop in mind. Every time I drive down East Divide Avenue and pass the Winger Apartments, I can’t help but start singing “Seventeen” or “Down Incognito”. I’m not a Winger fan, but I’m aware of the body of work. 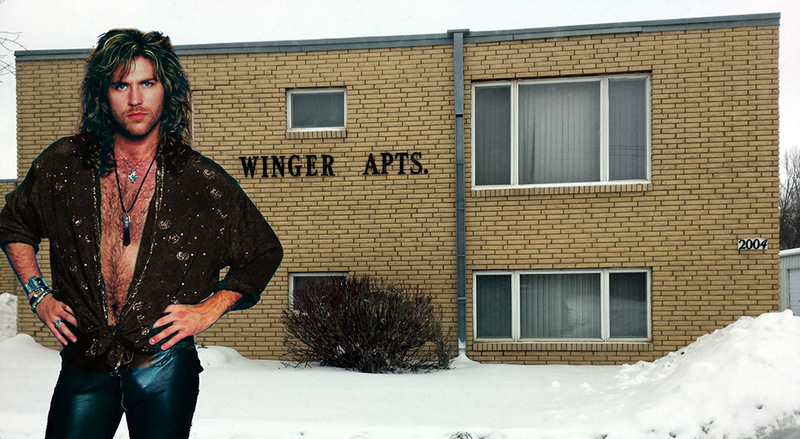 So in this case I dug up a photo of Kip Winger, threw it in the foreground, and while it is not my finest work it at least got this out of my system. If I was a renter here I’d get a cardboard standup of Winger and put it in the window. How many folks do you think would get it? This entry was posted in Around Bismarck-Mandan, Funny/Unusual, Music by Clint. Bookmark the permalink.